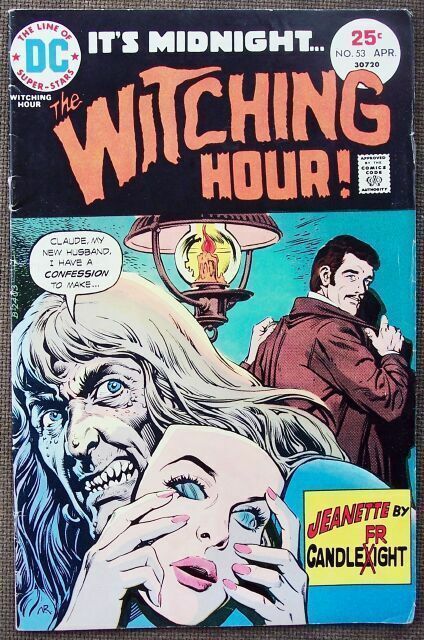 DC Comics Inc - The Witching Hour - No. 53, April 1975 Good readable comic book. DC Comics Inc Three stories 1. What Gruesome Grave Awaits Me 2. Jeanette by Candlefright 3. It Takes a Witch Vintage ads including one for Twinkies featuring Batman The Witching Hour, Vol. 7 No. 53, April 1975 Condition: Really nice reading copy, not of collectible quality Natural age toning No missing pages. Only issue is a little edge wear on front cover...minor, and a small center lower back page tear of about 1/2" Shipping: US buyer to prepay sale amount and shipping of 5.00 USD, add 50 cents per additional comic purchased. Canadian buyer your shipping will be 5.00 USD, add 50 cents per additional comic purchased. International sales welcome, shipping will be 7.00 USD, add 50 cents per additional comic purchased. Payment can be made by Paypal, Bank Check or Money Order, or if from the USA, an US International (pink) Postal Money Order. Canadian buyers will have the option to make payment in Canadian dollars, a conversion will be provided for you. Any questions, please e-mail. Will combine sales where possible to lessen postage. Please check out my other booth items.